Sometimes life just sends you a gift. For me these gifts are cars that make me feel good. It may be that they are luxurious, fast, fuel efficient, great handling; any number of qualities makes me grin. A week ago, I drove a 2009 Nissan 370Z. I was prepared for quick acceleration and nimble handling. I was not expecting fantastic fuel economy. 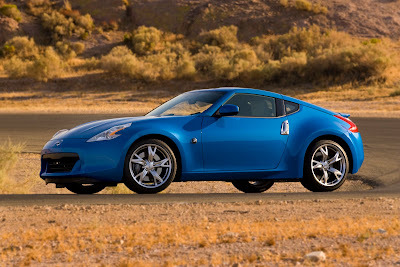 The 370Z, powered by a 322 hp, 3.7-liter DOHC V6 is EPA rated at 18-city and 26-highway. It is rare that a vehicle exceeds the ratings, even rarer when a performance car does so. On my daily commute, which is probably 70-80% highway, the 370Z averaged close to the highway figure. I zeroed the onboard computer to get the fuel economy for just the highway portion and it showed slightly over 28-mpg at 70-75 mph. Astounding! In all my driving in the 370Z I could only find one problem, and it really is only a problem for us old farts, getting in and out of the driver’s seat. It seems to be a long way down. Once in the car I couldn’t care. I have no idea how quick the 370Z really is - I didn’t put a stopwatch to it – but I can tell you it moves. The engine revs so quickly, and makes such tantalizing sounds, that you have to be on the ball or you’ll run right into the rev limiter (and that will make you look pretty foolish). Even though the engine is so rev happy, there is an abundance of torque – 270 lb-ft. I found that even when in sixth gear the engine pulled nicely. I know that Mr. K, the father of the Z-Car has criticized the 370Z because in his opinion it does not adhere to the basics of the original. I disagree. Yes, the 370Z is bigger and better equipped but underneath it is still a wonderful engine in a willing chassis. According to the Bureau of Labor Statistics, the original Z’s price of about $3,500 would only be about $20,000 now. That does not take into account the extra equipment that must go into a modern vehicle – safety and emission components that were not a worry in 1970. For my money, the 370Z is a different car for a different time. It is a worthy successor to the 240Z, and it is a sports car worth considering.